Special thanks to Kelly from Sass & Veracity and Ben from What’s Cooking? for hosting this month’s challenge! 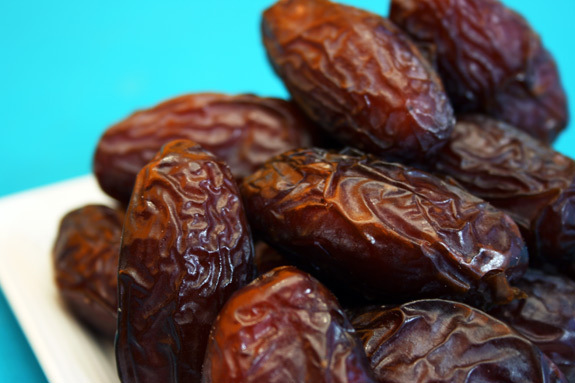 Growing up in a Middle Eastern home, dates were something my family always had around. The medicinal properties that my grandmother claims this humble fruit holds are endless, but I was never one who needed any sort of convincing to eat these sweet, chewy nuggets. I did find out, though, that there is archeological evidence of date cultivation since 4000 BC, to which my grandmother simply responded with the Arabic equivalent of, “I told you so.” I want to dedicate this entry to my grandmother because I drew inspiration for this challenge from her date-stuffed semolina cookies that I grew up eating. I didn’t tweak the recipe for the pastry too much. I used the zest of a lemon instead of an orange because I thought it would go better with the lemony undertone of the ground cardamom. I also didn’t use vanilla beans because, let’s face it, even though I already graduated, I’m still living on a college student budget. 1, 2, 3, 4, repeat. The recipe for the dough was great. I loved that cardamom was already included in the recipe because I felt that it went well with my Middle Eastern theme. This is a shot of the dough after four turns and I absolutely loved how you could see the specks of cardamom and the laminated butter running throughout. Of course, the braid part of the challenge flew right over my head and so I opted to make individual portions by cutting out disks using the rim of a small drinking glass. This was not a great idea when it came around to eating the little things because I never felt guilty about having one more piece. In fact, as I’m writing this, I’m munching on a piece and telling myself that a visit to the gym will be necessary tomorrow. 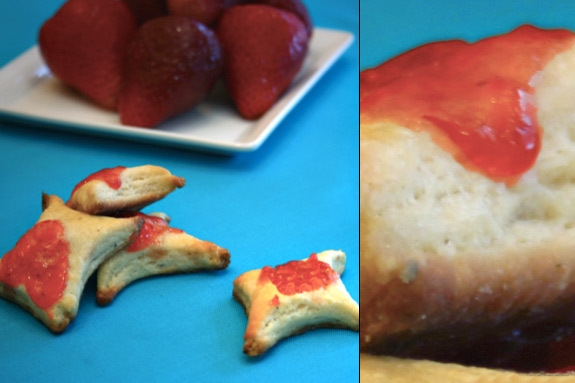 Since I know that dates might not be everyones cup of tea, I used the scraps to make star-shaped pastries with a strawberry jam center. Because I know EXACTLY how it feels to be that kid unpacking the “weird food” during lunch while Timmy gets to build his Pizza Lunchables and enjoy his chewy chocolate chip cookies. Anyway, I digress. 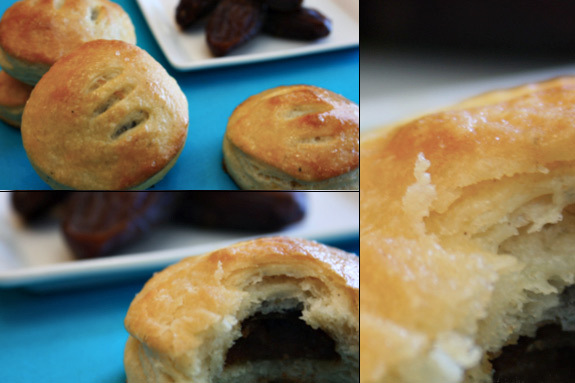 The star-shaped pieces tasted good, but I had my eyes set on the prize – the medjool date, Danish-inspired pastry. The secret to the date filling is to throw in a couple teaspoons of butter so that the filling doesn’t dry out in the oven. Other than that, the filling is nothing more than pure dates that have been pulsed in the food processor. 250 g. flour + 40g. Combine the milk, yeast, sugar, lemon zest, cardamom, vanilla and egg using a paddle attachment. Switch to a hook attachment and add the 250g. of flour and salt gradually and mix until a dough is formed. Combine 1 stick of butter with the remaining flour until just throughly combined. 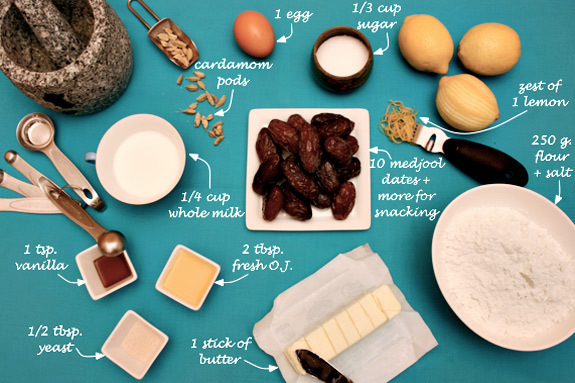 To make the filling, process the medjool dates with 1 tbsp. of butter until smooth and set aside. 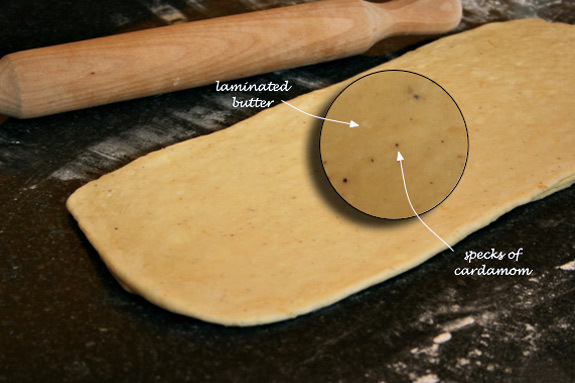 Roll out the dough into a long sheet and cover 2/3 of it with the butter mixture. 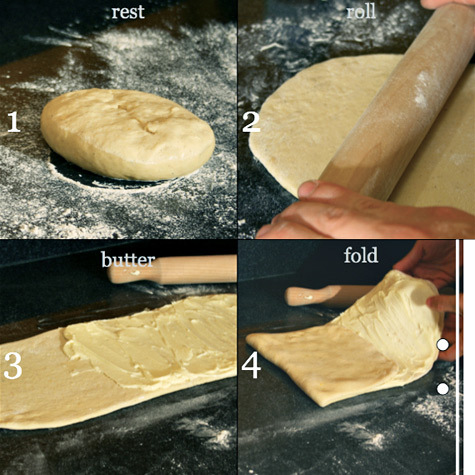 Fold so that you have alternating layers of butter and dough and refrigerate for 30 minutes. Repeat this process 4 times, making sure to refrigerate after each step. 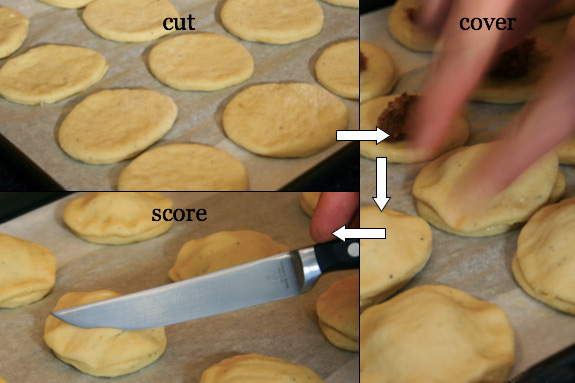 Roll out the dough one final time and cut out into small disks. Top half the disks with a small amount of the date mixture and seal using the remaining disks. Bake in a 400 degree oven for 10-12 minutes or until golden brown. 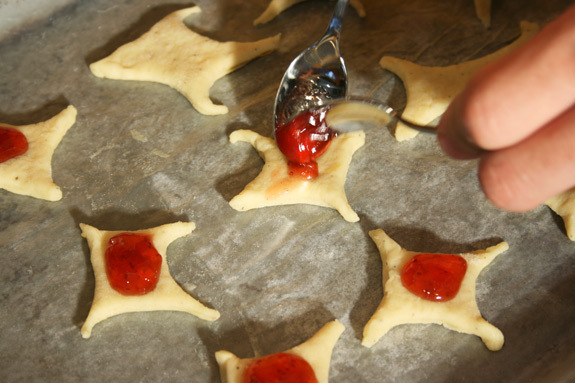 Note: For a nice shiny golden brown finish, brush the top of each pastry with an egg wash (an egg with a tsp. of milk or water). One of my best friends from high school, Yuliana, was visiting this weekend so I was happy to share the fruits of this challenge with her (and my roommates, of course). Raquel also went to high school with us and so we all had a fun weekend talking about how OLD we all are and how crazy it is that high school was so long ago. Haytaliye (hay•ta•lee•ya) is a traditional Aleppan dessert that is popular during the scorching summer months that characterize the Middle East. And trust me – even though we’re thousands of miles away, nothing brings out the heat more than lugging densely packed boxes up three flights of stairs. 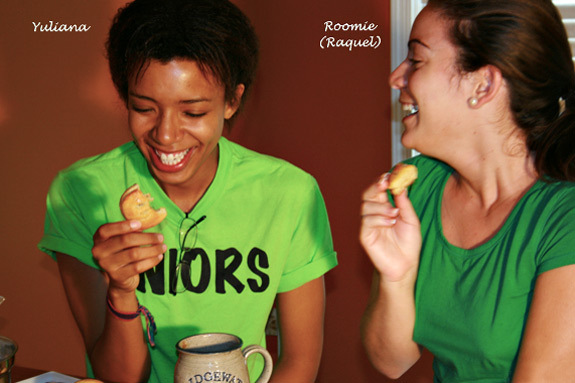 Plus, the entire dessert is made with things most of us would already have in our kitchens on any given day. 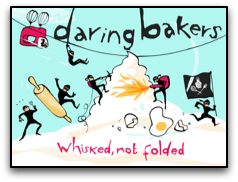 The dessert itself is nothing more than whole milk cooked with cornstarch. 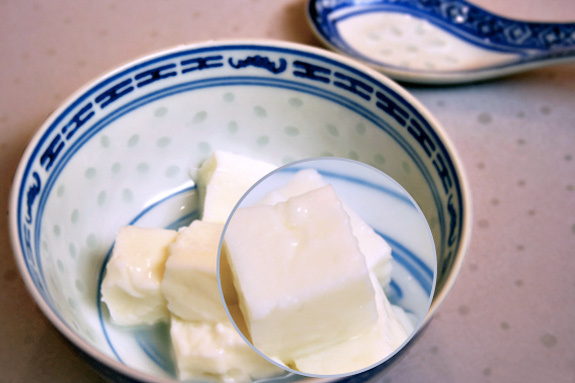 This mixture is then chilled, cut into bite-sized cubes, and served as the foundation for the other toppings. Traditionally, this dessert is served with clotted cream ice cream, but that’s pretty hard to come by in the States. 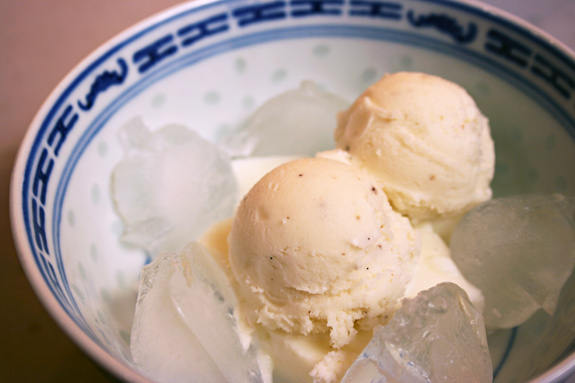 Instead, I use high quality vanilla ice cream, and it works quite well. The third component of the dish, and arguably the most important, is the orange-blossom-infused simple syrup. A simple syrup is equal parts water and sugar, barely boiled until the sugar has completely dissolved. Once it’s done, adding a touch of orange blossom water gives the syrup its unique flowery fragrance. Combine the water and sugar, bring to a boil over medium heat and remove once the sugar has diluted. Add the orange blossom water and refrigerate. Set aside enough cold milk to dilute the cornstarch and bring the remainder of the milk to a boil. Once the milk has come to a boil, add the cornstarch that has diluted in the cold milk and stir constantly for 3-5 minutes to avoid lumps. Lower the heat to low and cook for another 45 minutes, stirring every 5-10 minutes. 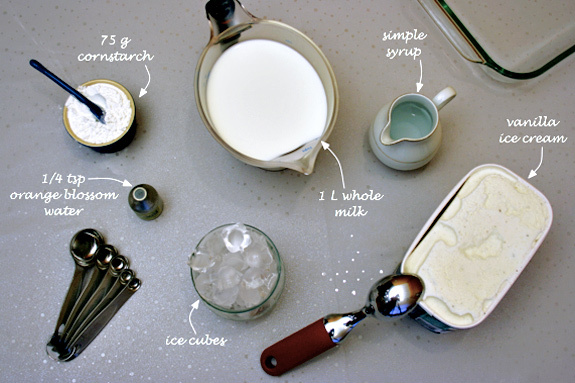 Once everything has chilled, slice a few bite-sized cubes of the milk (leaving the preservation water behind), top with ice and ice cream and serve the chilled infused syrup at the table so that your guests can control how sweet they would like to make their dessert. 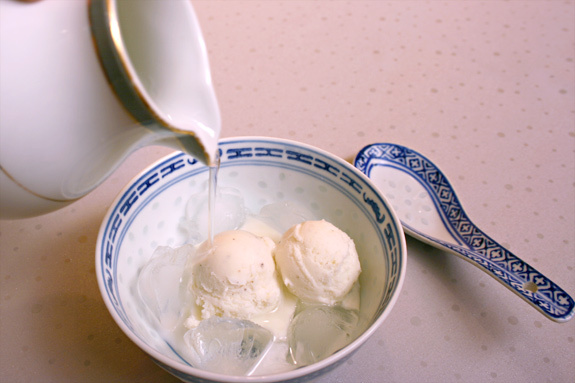 Note: Once you add the cold water, the milk mixture should seize and the water should remain clear. 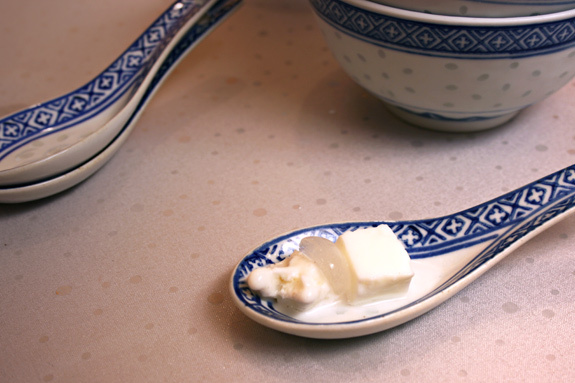 The water will preserve the milk mixture and prevent it from drying out in the fridge. If done correctly, tiny wrinkles will form on the surface of the milk mixture due to the shock from the rapid change in temperature.